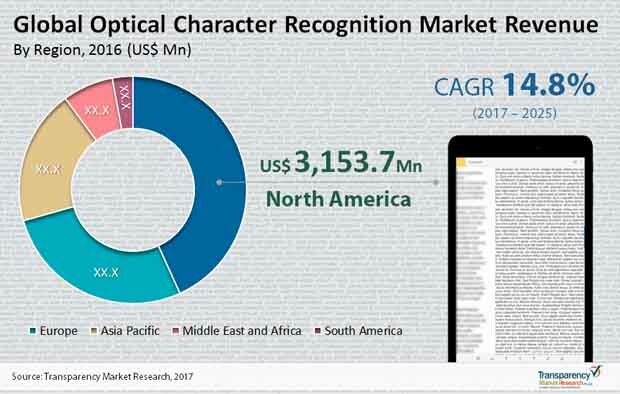 Considering the presence of numerous players, the global optical character recognition (OCR) market features a highly competitive and fragmented vendor landscape. In this scenario, to outdo their competitors, keen and well-entrenched players could adopt multi-pronged growth strategy. Among a few growth strategies, competitive pricing is a popular one adopted to draw more consumers. Besides, they are also considering mergers and acquisitions and carefully-crafted alliances to expand their outreach and explore the potential of markets. With a view to consolidate their position, keen participants are vying to add new services to their portfolio. A new market study by Transparency Market Research (TMR), the global optical character recognition market is predicted to clock an impressive 14.8% CAGR during the forecast timeframe of 2017-2025. Escalating at this rate, the market would be worth US$25.1 bn vis-à-vis revenue by the end of 2025. Based on type, software could account for a key share in the market. The segment of software comprises desktop based, cloud based, mobile based, and others. The software segment is likely to retain the dominant share buoyed particularly by the banking sector. In terms of region, North America is poised to make a mark while collecting maximum market share. However, Asia Pacific is projected to rise at a faster pace displaying 15.6% CAGR between 2017 and 2025. The global optical character recognition (OCR) market is gaining due to the need to convert several forms of documentation such as PDF files, digital images, and scanned paper documents into searchable and editable data. The overall document management process has been upgraded in a host of industries. OCR finds extensive acceptance and is widely implemented in business processes as it offers phenomenal speed and accuracy at the same time. Government, education, healthcare, finance, legal, and banking are some key business domain where OCR finds extensive application. Optical character recognition refers to a technology that has brought about a revolution in the document management process in several business domains such as legal, education, healthcare, banking, finance, and government. In the light of several features of OCR, it could serve to be a beneficial tool to deal with vast amount of historical data or massive paper documentation that needs to be converted into digital form. It has helped to eliminate traditional book-keeping and paper documentation in offices into a paperless one. This is done by means of digitization of documents and communications that have so far remained resistant to digitization. This includes scanned paper documents, PDF files, or digital camera images. Further, optical character recognition that evolved from a special purpose reader to a multi-purpose interactive system has helped to lower the cost of data capturing. This has paved way for the development of more reliable systems. The digitalization boom could serve to foster as well as challenge the worldwide market for OCR in the years ahead. Digitalization could slow the growth of this market as paperwork is eliminated in digitally revolutionized organizations. In addition, insufficient knowledge of OCR technologies could hamper demand.